A reflection at the end of the EMIN BUS awareness raising tour. Later there will be time to check, to analyse further, to go deeper in the reflection and develop a more collective response. But this reflection is made while the tour is still fresh in our minds. 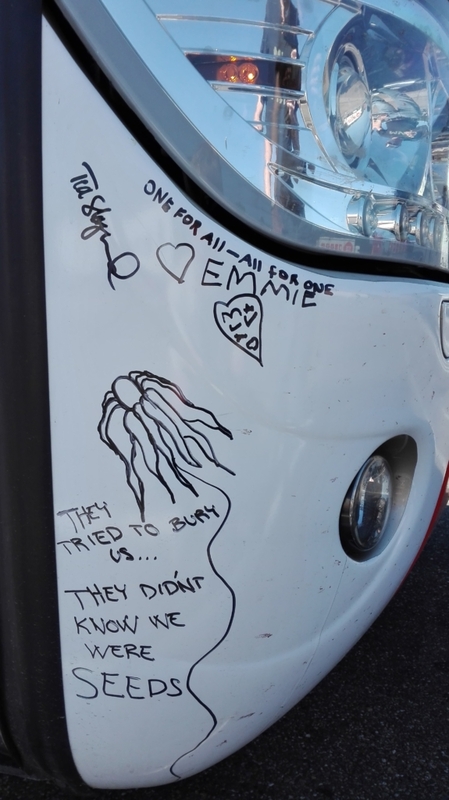 EMIN Bus Tour: The focus of our #eminbus was on Minimum Income Schemes, the realities at ground level and the role of the EU. Spreading a message of the importance of a targeted universal approach that can guarantee minimum income for everyone and the role that adequate, accessible and enabling minimum income schemes can play to achieve that, with the message that everyone benefits from such an approach. What have we discovered about Minimum Income Schemes: We already knew a lot from our national EMIN teams. Detailed reports of the realities in each country can be found on www.emin-eu.net. However, meeting and talking with people in all corners of Europe brings the information to light in a totally different way. It would be no exaggeration to say that our minimum income schemes are in a state of crisis all over Europe. In some countries they are so low and so inadequate that they exist more virtually than in reality (for example, Latvia, Bulgaria, Hungary…) In other countries they are new and vastly under developed (Italy, Greece). In some other countries exaggerated conditions and forced activation have turned the schemes into obstacle courses rather than spring boards for active engagement in society and the world of work (for example, UK, Denmark, Austria). In Nordic countries were social insurance schemes provide decent levels of protection, there is under investment in social assistance schemes leading to hugely inadequate schemes (Norway) and schemes declining in their relative value (Finland). Extreme difference within countries was also highlighted, for example in Spain you have in some regions schemes approaching the best in Europe, while in other regions they are close to the worse. In Norway schemes can vary from between 300 and 600 Euro approximately. We have also observed that in some countries Minimum Income Schemes lift people from deep poverty (Portugal, Estonia, Slovakia…) and enable people to survive but not to thrive. However, we have also observed the self-defeating practice that to access minimum income schemes you have to first go deep in poverty (divest yourself of existing assets) before you qualify for minimum income (Austria, Sweden….) making the road back to recovery even harder. On the journey we also heard encouraging developments, genuine efforts to improve the Minimum Income Schemes (such as in Macedonia/FYROM, Lithuania, Cyprus, Slovenia and in Castile-la Mancha, Spain). Important experimentation in Finland and Netherlands, progressive tax reform in Estonia, large civil society mobilisation behind a socio-economic development plan in Televera de La Reine (Spain), impressive NGO work in the face of difficult circumstances in Hungary, integrated development work as part of the Food Banks in Olysten, Poland. In EMIN we have claimed for the progressive realisation of adequate, accessible and enabling minimum income schemes. However, what became clearer in the journey is that Minimum Income Schemes work for everybody only when they are at decent levels. Therefore, progressive realisation will not be enough and at some stage countries with poor quality schemes need to make a big jump forward to make their schemes fit for purpose and capable to function properly. European Pillar of Social Rights: It is extremely worrying from the perspective of fighting poverty but also from the perspective of trust in democracy that 6 months after signing the European Pillar of Social Rights (including right 14 on adequate income) that countries make proposals which weakens their minimum income schemes. They potential changes in Belgium and Austria are particularly worrying and our networks will follow these proposals carefully with the intention to avoid these steps backwords. The European Pillar of Social Rights can play a positive role to bring social concerns more central in key EU processes, social and economic governance (Semester, Europe 2020, use of Structural Funds…). This needs to be championed by the President of the Commission and the Commissioner for Employment and Social Affairs. It needs also to be followed carefully in the European Parliament. However, these processes do not reach the people we have met on the streets. For this the European Commission must take a more proactive role. Efforts need to be made to spread knowledge and information about the Pillar in the broader society. Specific legal instruments, such as the Directive on Adequate Minimum Income Schemes will be needed to build confidence that Europe is not just a union for businesses but also a Union for people and social concerns. Tax justice, distributive and redistributive mechanisms, and social knowledge (developed through, academic experts, experts by experience and on the ground practitioners) need to valued in EU discussions and inform EU practices and policies. The Future: Who knows when the time will be right for EMINBUS two, to check how Minimum Income Schemes have developed and to see if the European Pillar of Social Rights has delivered on its promise. « DAY 66: BUS 1&2: EMIN BUSES BACK HOME!